Over the last decade, the beach price per kilo for wild-caught abalone has dropped by about 50% (after allowing for inflation). The main reason for this decline in industry value is more competition - particularly from farmed abalone. The most important market for Australian abalone products in terms of both volume and value is currently mainland China. Demand is subject to normal economic forces, but appears to be fairly constant. However, in a market that is growing in line with the Chinese economy, Australian abalone returns and capital growth have been steadily declining since 2000. It is the view of the Abalone Council of Australia (ACA) that a serious commitment to trialling a product differentiation strategy and an associated marketing effort in China is required to ascertain whether it is possible to prevent further economic damage and start improving the value of unit holders' investments. Research to date suggests that the best opportunity is to establish a program that increases demand for Australian wild caught abalone in Chinese restaurants. This project was designed to work towards establishing that program. Select members of the project team visited Shanghai in the first week of August 2009 to interview the shortlisted marketing agencies in order to identify and select a marketing partner for the project – Grey Group was the selected Agency. During late August 2009, three principal members of the Grey Group appointed to head this project travelled to Australia on a familiarisation tour and visited four abalone processing premises. Grey Group worked with the Principal Investigator to develop the preferred project plan for Stage 2: 'Analysis of product differentiation opportunities for Australian wild caught abalone in China'. 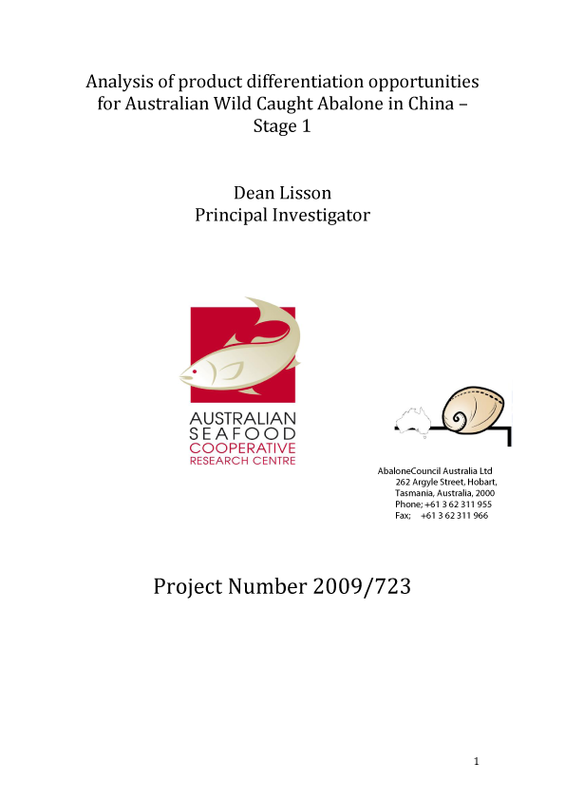 Four abalone processors in Australia have sent letters formally supporting the project (stages 1 & 2) and commit each company to providing abalone product for the Promotional trial activities scheduled to commence in China during early 2010.